Aruba, the Dutch Caribbean island famous for its white powdery beaches, is located just 15 miles (approximately 24 kilometers) north off the coast of the Paraguaná peninsula of northern Venezuela, South America. From the United States, Aruba is located about 1165 miles south-east of Ft. Lauderdale, Florida. The island is situated in the southern Caribbean Sea, about 50 miles (81 kilometers) west of Curaçao, and about 108 miles (175 kilometers) west of Bonaire. Aruba is not surrounded by an ocean of its own. The surrounding ocean is the Caribbean Sea that is connected to the Gulf of Mexico to the northwest, and the Atlantic Ocean to the northeast. On clear days, you can see the Venezuelan mainland, looking to the south. The distance to the coast of Venezuela is only 15 miles. Related questions people are asking often are “Where is Aruba located on a map”, and “Aruba, where is it”? To see where the “One Happy Island” is located on a world map, use the Google map below. You can zoom in and out to get a good sense of where Aruba is located on the globe. The map displays Aruba accommodations too, so you can check out where most of the hotels, resorts and apartments are. Is Aruba a U.S. Territory? No, Aruba does not belong to the U.S., which means you’ll need a passport in most cases. The U.S. territory of Puerto Rico is one of the closest Caribbean islands to the United States. Similar questions people often ask are “What country is Aruba in”, and “What country is Aruba”? Yes, Aruba is a country! To be exact, Aruba is a constituent country, meaning that it’s part of a larger country or federation. Together with the Netherlands (located in Europe, also known as “Holland”), Sint Maarten (Saint Martin) and Curaçao, Aruba is part of the Kingdom of the Netherlands. The head of state of Aruba is King Willem-Alexander of the Netherlands. So How Big is Aruba? The island is rather small. It’s only 19 miles long. Aruba has a land area of approximately 180 square kilometers (70 square miles). If you’d go from the island’s south-eastern tip to its north-western tip, you will only have traveled about 30 kilometers (19 miles). Aruba is just over 8 kilometers (5 miles) wide at its widest point. By car, you can go around the entire island in just a few hours. In fact, Aruba is the smallest of the “ABC Islands”. Does Aruba Have any Mountains? Absolutely! The island features two mountains actually, they’re named Hooiberg and Jamanota. Hooiberg is a volcanic mountain that looks like a haystack, its height is about 165 meters. It’s the second highest mountain on the island. Jamanota is the highest point on the island, with a height of 188 meters (617 ft). How do You Pronounce “Aruba”? Good question! Like so: “Ah-ROO-Bah”. No real need to roll your R (but most locals do)! Remember that Beach Boys song that goes “Aruba, Jamaica, ooh I want to take you to Bermuda, Bahama…”? That’s exactly how you pronounce “Aruba”. What Are the ABC Islands? 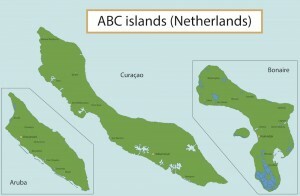 The “ABC Islands” are made up of Aruba, Bonaire, and Curaçao. These three Caribbean islands are part of the Lesser Antilles, together with the Virgin Islands, Saint Martin, Guadeloupe, Grenada, Barbados, and Trinidad & Tobago. 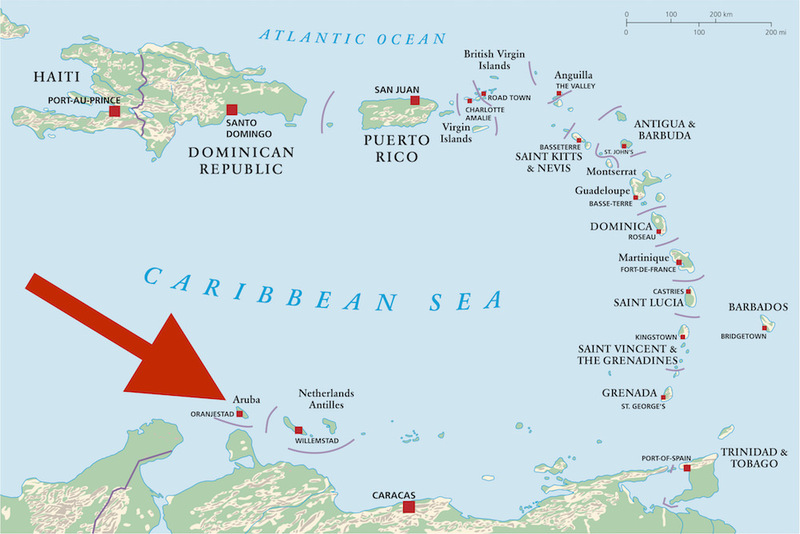 Aruba and the other Dutch islands like Saba, St. Eustatius, and St. Maarten in the Caribbean are often called the Netherlands Antilles or the “Dutch Caribbean”. From Aruba, Curaçao can be reached via a short flight of only 80 kilometers which should take no longer than 40 minutes. The island of Bonaire also conveniently lies within reach with a distance of only 175 kilometers. If you’re staying in Aruba long enough, Bonaire and Curaçao are perfect escapades for day trips or weekend trips. It’s pronounced like “Oh-RUN-Ya-Stut”. Something like that! Oranjestad, founded in 1796, is located in the southwest of the island. Oranjestad has a little over 30.000 inhabitants and is Aruba’s largest city. Other smaller cities are Paradera, San Nicolas, Noord, Santa Cruz, and Savaneta. Aruba’s major and only national airport is Reina Beatrix International Airport, located in Oranjestad. Aruba even has an oil refinery that is located at the southwestern part of Aruba, close to San Nicolas. Most of the hotels are located north of Oranjestad. But also in the vicinity of the city, hotels and other types of accommodation are available. The official languages of Aruba are Dutch and Papiamento. Papiamento is a creole language, spoken on Aruba, Bonaire, and Curaçao. The language contains words from Portuguese, several African languages, Dutch, and Spanish. Thanks to international tourism, many people in Aruba also know how to speak English quite well. Other languages spoken on the island are Portuguese, Chinese, German, and Spanish. French is also spoken, albeit in small communities. What is the Population of Aruba? For 2019, the estimated population of Aruba is approximately 106,000. The country’s population growth rate is 0.36%. Aruba’s population density is just under 600 per square kilometer. What is Aruba Weather Like? Aruba weather conditions are classified as tropical with a fairly constant temperature of 82 degrees Fahrenheit (28 degrees Celsius) year round. Temperature differences between day and night and summer and winter are a mere 38 degrees Fahrenheit (4 degrees Celsius). Constant trade winds coming from the Atlantic Ocean cool the island considerably. Aruba lies south of the hurricane belt, and the island is influenced by the fringe effects of tropical storms in the area on occasion, causing dangerous swimming and surfing conditions at worst. According to the Aruba Tourism Authority, Aruba welcomes over 700,000 visitors a year and an additional 500,000 cruise ship passengers. Approximately 70% of those visitors are from the United States. Also, visitors from Canada are contributing for a large part to the number of total visitors who would like to spend their vacation in Aruba. It is fair to say that the number of tourists that find Aruba to spend their holidays in the Caribbean is consistent and is showing growth from time to time. Growth or no growth, when you travel to the Caribbean, Aruba is a top destination that has to be visited! Aruba vacations should actually be part of your bucket list! Going home after your trip is a difficult thing to do. It is just one of the most beautiful islands in the Caribbean. Guaranteed!